Artificial nests for the Hobby &dash; Falco subbuteo. by Andrew Freeman and Pat Wixey. Many field biologists, and keen ornithologists, have long used nest boxes as a means of studying bird populations. For the most part this involves the simulation of tree cavities, or less often, the stick nest of another bird. In doing so ornithologists, have over time, quite extensively explored many of the possibilities for most cavity nesting species, particularly so for raptors and owls. There is however still considerable scope for those birds of prey that 'stick nest' - those birds that build their own or utilize the old nest of another. Amongst these in particular the secondary users prove to be the most amenable to artificial nest provision; primary users are capable nest builders, and though they will build on-top of an existing nest or platform, more usually they build where and when they please. Secondary users, however, have little or no inclination towards nest building proper, with only rudimentary efforts, in the form of nest lining removal and twig arranging, being made. In Britain only two owl species and four falcons can be termed secondary users, where 'stick nesting' is concerned, and only two of these six are habitually so, with the remainder being somewhat sporadic in their choice between cavity/rock ledge or stick nest. Tied in their breeding habits to the utilization of old nests, are Hobbies (Falco subbuteo) and Long-Eared owls (Asio otus), and of these two only the Hobby appears not to have been previously catered for. Fortunately my southeast Oxfordshire home lies in the heart of the Hobbies breeding range with regular nesting, until the clearance of elms by Dutch Elm Disease, on the farm. The identification of active nesting ranges was the first step and almost immediately it became apparent that, though not numerous, the species was well represented in the region (Bucks and Oxon). Hobbies probably occur at their maximum density in this part of their range [Fuller 1985], but even so, it would not have been effective to provide nests randomly, due to the abundance of alternative sites in the form of old crow nests. Such random provision will probably never produce the kind of occupation rates experienced with cavity nesters such as Kestrel (Falco tinnunculus) or even Barn Owl (Tyto alba). Hobbies have adapted to being very mobile in their choice of nest site from one year to the next, because of the biennial, or even annual, nature of many nests. Thus, only within nesting ranges, were suitable, potential, nest sites chosen and artificial nests provided. Initially these were either constructed from scratch, using waste materials, or existing structures were reinforced with wire and sticks; the repair of old nests during winter months has proven successful on several occasions in the past (Woodland pers.comm.). When constructing nests one of two methods are employed. Early models (see Fig. 1) consist of a bicycle rim with a chicken wire bowl lined with turf, which is then built up with sticks and the contents hat pinned in place with willow whips. These, however, were soon phased out in favor of better construction materials; the basis of which being a wire framed hanging basket, with durability the main advantage. 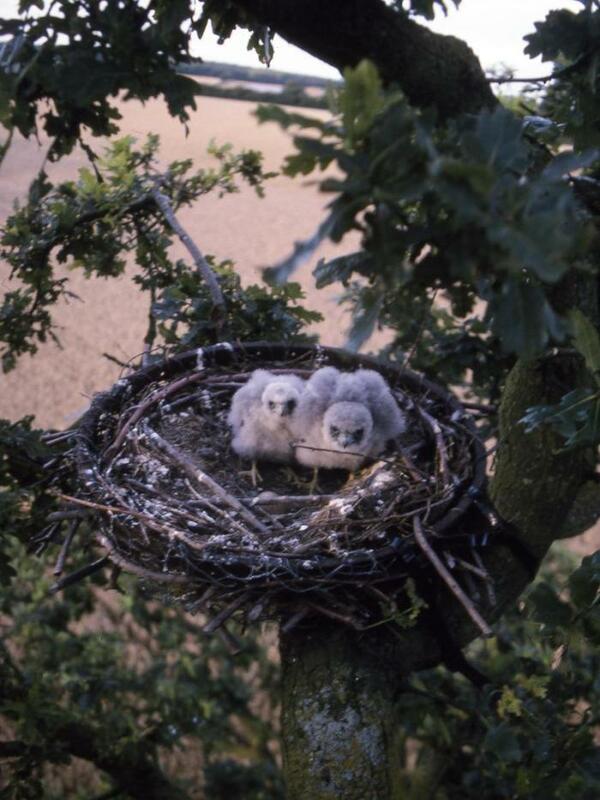 As early as 1994 resident Hobbies showed an interest in the artificial nests provided, culminating with nest selection and subsequent breeding in 1997 (Fig. 1). At the end of June 97 this pair laid a typical clutch, for Hobby, of three eggs and later hatched and fledged two young, a most welcome success. 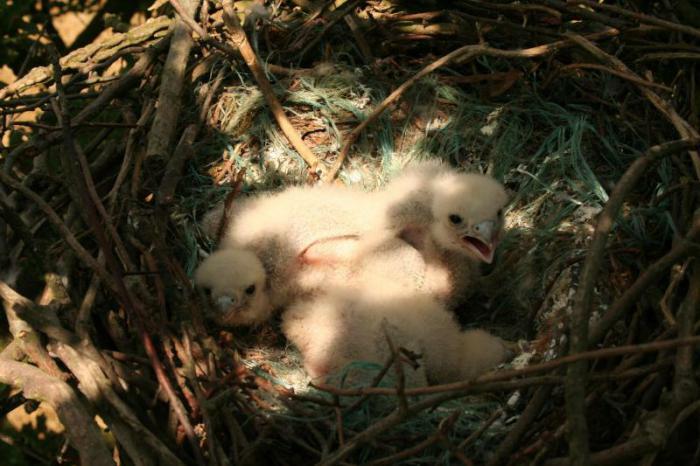 A second pair also fledged a brood of two from an artificial nest in Buckinghamshire. 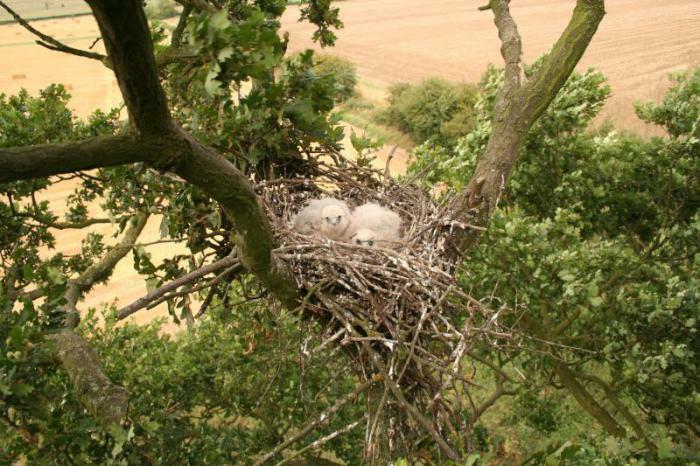 A number of other species have occupied nests including Wood Pigeon and the ever-present, unwelcome, verminous squirrel, which destroy many nests. The project is very much on going and the numbers of Hobbies, and artificial nests, increase annually. The eventual aim is to perfect the use of the nests as a study tool and implement their use in wider studies of the species. To this end this paper is only intended as an interim report on an early success, for further developments watch this space. Figure 1. A brood of young Hobbies on an artificial nest of the bicycle rim type. Figure 2. 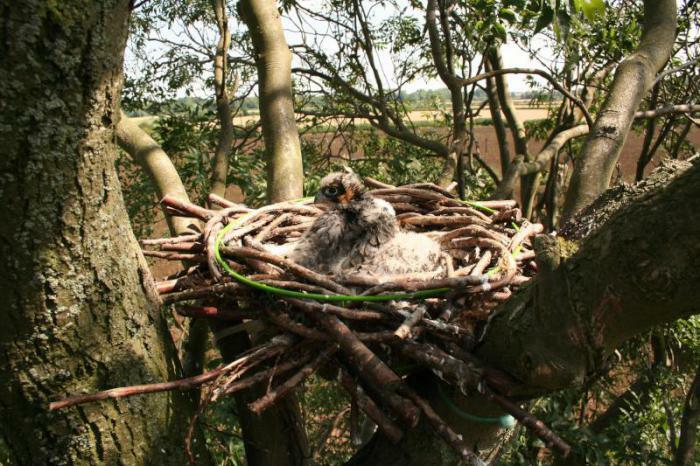 This was the second artificial nest to be used in 1997 this time in Buckinghamshire. 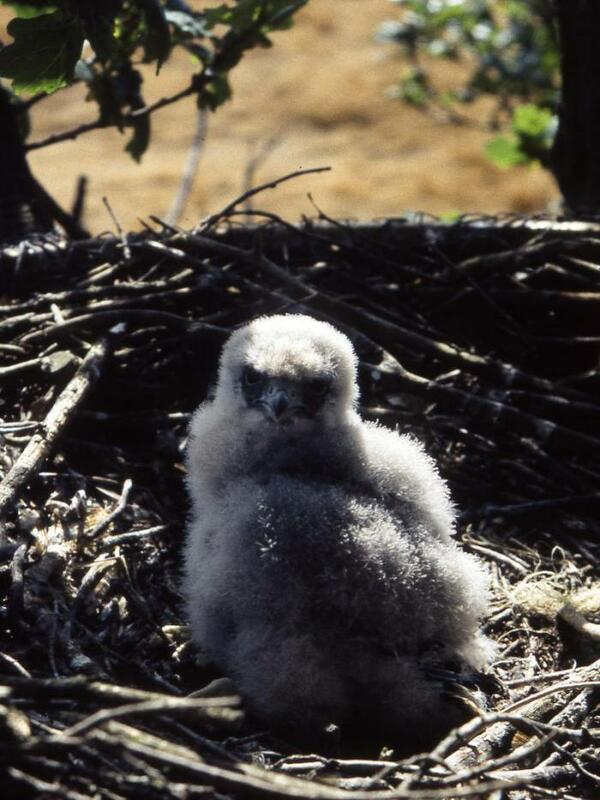 The nests in figure 1 and 2 were reoccupied in 1998 and two broods were successfully fledged. Figure 3. One of the later nests constructed from a wire framed hanging basket. Figure 4. As in this picture, the nests of Carrion Crow (Corvus corone) are the most commonly used and most often occur in Oaks (Quercus robur). Figure 5. A carrion crow nest, in which the original occupants included polypropylene bale string as part of the nest lining. The chick in the lower part of the picture already has its feet enmeshed in the finer filaments of the twine - it was easily released. Sometimes the nests are so badly contaminated, it is necessary to remove the young, and then substitute the nest for an artificial one. One nesting failure was caused when the entangled female, thrashed herself free leaving one foot hanging from the side of the nest. The nest was removed, dismantled and contained an incredible 60'5" of string! Originally, published in 1998 in The Hawk & Owl Trust journal The Raptor, this article is reproduced here in a lightly revised version - mainly in the form of additional pictures - for the Oxford Ornithological Society. First and foremost I would like to thank Dr Philip Burton for his advice and background information on the species in Bucks and Oxon, and without whom licensing for this species would not have been possible. It also has to be said that gamekeepers have proven to be some of my greatest allies, not just in my search for hobbies, but in the wider search for other raptors. Cramp, S. & Simmons, K.E.L. 1980. The Birds of the Western Paleartic. Vol. 2: 316-327. Oxford. Fuller, R.J. 1985. Breeding populations of the Hobby Falco subbuteo on farmland in the southern midlands of England. Ibis: 127: 510-516.